It's a lot of fun to watch the Sabres these days. At the beginning of the 2018-19 NHL season, we imagined we’d be spending some time writing about the Buffalo Sabres. That assumption was based on the fact we’d probably have to discuss what they could do to improve and analyzing what went wrong this time. Well, that’s not what we are here to do today. 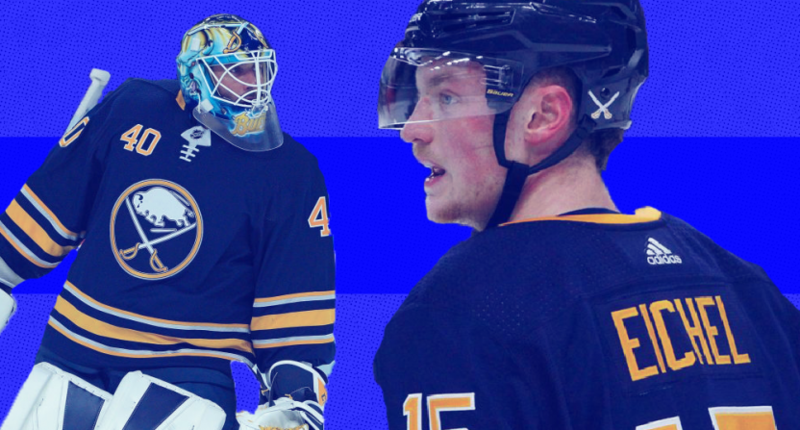 The Buffalo Sabres are one of the best and biggest surprises so far in 2018-19. It feels weird to type that after watching the Sabres finish last – they were the first NHL team to ever finish 31st – in 2017-18. The Sabres have rattled off nine consecutive wins, propelling them up the standings and into the upper tier of the Eastern Conference. A nine-game streak is impressive on its own, but it’s even more remarkable when you realize the Sabres finished last season with just 25 total wins. Looking back, the Sabres picked up their 16th win last season on February 10th. They reached that same plateau a bit quicker this year, earning their 16th win on November 24th. So, what’s driving the recent success in Buffalo? For starters, the team is receiving some strong goaltending from the duo of Carter Hutton and Linus Ullmark. That may be an understatement, as the two have nearly identical GAAs with Hutton at 2.53 and Ullmark at 2.52. There were questions on whether Hutton could hold down a larger workload as a starter in the NHL, but so far, he has risen to the challenge. Jack Eichel is leading the team’s offense with 28 points in 24 games, but they’ve also received strong contributions from Jeff Skinner (26 points in 24 games) and Jason Pominville (nine goals and 18 points in 24 games). The improved depth and the ability for any player to step up at any given time – as seen repeatedly during the win streak – isn’t something we’re used to seeing in Buffalo. Beyond the numbers, you can see a larger level of commitment from the roster than you could in previous seasons. That’s a fact forward Kyle Okposo noted with USA Today. The 2018-19 season is still fairly young. Though the Sabres have taken the league by surprise during their lengthy winning streak, there’s still a tall mountain to climb to reach the playoffs. The Sabres will need to take all of the lessons they’ve learned during their streak and call upon them when things don’t go according to plan. They’re easily the best surprise so far this season, but we hope this isn’t one of those surprises that burns out before the season reaches its conclusion. Does Buffalo have what it takes to make the playoffs for the first time since 2010-11? We’re becoming believers.